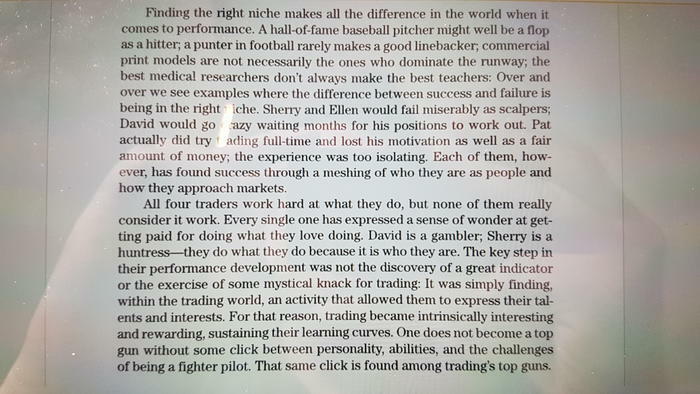 You have just learned the most important lesson… “There is no magic trading strategy.” It will depend on your trading style and personality. And trading strategies may only work in certain types of market conditions. I haven’t seen one that works all the time. You might also be over-trading and expecting a lot from the trading strategies. Or just experienced using the strategy at the wrong times and conclude that they don’t work and continue with a new strategy. What’s your investment horizon? Minutes? Days? Weeks? Do you want to watch a position by the minute, or want minimal supervision? What’s your risk appetite? How much are you willing to lose per trade relative to your capital? Do you perform well when the system needs discretion or when you act on the signals like a robot? Each trading system will cater to a different personality. If the system does not agree with your personality then you will naturally become stressed and it will not work. It fits YOU. YOU must be able to trade it. I would strongly suggest that you don’t look for ‘perfect’ indicators, but instead try to learn about things like R-multiples, expectancy values, profitability parameters. The whole ‘Money- and RiskManagement’ enchilada. These topics were the one, real revelation for me how profitable trading really works. This method is generally overlooked by most but eventually the few and far between astute trader starts to take this method seriously after failing at all else. Amazingly, this method is so easy to learn because it is so simple. That is precisely why it is overlooked and never used by most. Yet it beats everything else hands down. It is a Rolls Royce system. But these cars are owned by only a few, and in the same way, only a few use this special system. The ones that do use it keep their mouths shut…because they are always in profit. The use of this method is kept somewhat secret. Its users always have a distinct advantage when they trade. They often get in and out of trades with a profit while all the rest are still struggling to find an entry point. What is this method? Interested?? Well, I am going to give you some hyperlinks to read and warm your heart. You may be able to guess the method. If not, I will re-post on this thread giving you the secret. That just leaves me with a Price chart!! Hmmmmmm…nobody is getting the guess correct. I am referring to simple candlestick trading ie using candlestick patterns to trade. I use 4 main patterns with great success. Candle patterns are easy to learn and their success rate is huge. As I see it, there is simply no better trading system. You may care to look at it if you have not already done so. I hope you will gain much from it and choose candlestick trading as your strategy. I know that there are many experienced posters on this forum and they only choose this method of trading. So JasonFX, like many others before you, save yourself many heartaches, fruitless research chasing systems that promise rainbows and produce money losses. I have been where you are now. I know that you want to make money, not fiddle around searching. Go for candlestick trading. It works - and thats what you want. Simply put,it is the best. I cannot encourage you more than give you this very accurate guidance. I guarantee you will never look back. I’ve tried loads, some with so many lines its like tracer rounds in a contact. LOL . Check out the “Ducks”, a nice uncluttered screen. Just requires patience. Thats what I think is a lot of peeps probs are at first you can’t wait to hit the buy/sell button. Phew, thats good to know. You wouldn’t believe the amount of systems I’ve tried only to find out that they’re incompatible with my broker. I would also like the best strategy to use so I can code it into an EA or indicator? The best I’ve found so far is Osfx strategy but with a 100 pips trailing not 50. Now lets put everything together into a swing trading strategy. This trading plan is for discretionary traders. Your success will depend on how well you use your discretion!Although it will depends on you. The Seahawk Strategy, which is a scalping strategy that's perfect for a slow market, e.g. before the opening. The best day trading strategy is always the strategy that fits the current market conditions! In a trending market, you want to use a trend-following strategy. These types of trading strategies are very rewarding, since you often see a winning percentage of 50% or more and the average profit per trade is larger than the average loss per trade. Since you make more money on your winning trades than you lose on your losing trades, you only need to be right 1 out of 2 trades and would still make money. If you could get your winning percentage above 50%, you are in good shape! The problem with these trading strategies is that they don’t perform well in sideways markets. If you trade a trend-following strategy in a sideways market, you will get whipsawed - and frustrated. Therefore you must make sure that the market is really trending before using a trend-following strategy. Some people say that the markets are only trending 20% of the time. I don’t know if that’s true, but it sounds about right. And sometimes there are days when the markets are not trending at all. Yesterday morning’s trading was the perfect example: in the 2 hours we had to trade for the trading challenge, there were no trends! Therefore using a trend-following strategy would not have been the best day trading strategy - at least not this morning! tymen1 , i supper agree with you, when i started i did like most new traders and after allot of lost $$ . I talked to a friend and he recommended to me an expensive book on the subject , that was the turning point of my trading . The book is Japanese Candlestick Charting Techniques by Steve Nison. In order to my trading experience, I , think, From all trading strategies scalping is mainly considered as a best trading approach that brings profit in a short time. Scalping might be (pretty much by definition) the trading strategy that brings in a profit in a short time - at least in theory! But does it actually work like that in practice is a very different matter. There are most certainly people who can trade scalping but it is not for everyone - and perhaps not for very many! It is extremely intensive and often requires trading against one’s own instincts and a series of losses can quickly demolish a lot of hard work and lead to severe frustration. In my experience, the majority of traders would say that the most profitable and consistent results in the long run come from longer term positions. But here lies the paradox in forex trading, short term trading offers more trades and quicker results, but with less accurate signals and smaller profit targets per trade and therefore needs larger positions to make a decent profit. On the other hand, long term trades usually give more reliable signals but usually take longer to complete and require larger stop levels and therefore only allow smaller positions for the same equivalent risk. This is an old thread but the problem is certainly the same still today. Personally, I think it is looking at the situation from the wrong end of the stick if you only try to choose which method is overall “best” and then go with it. 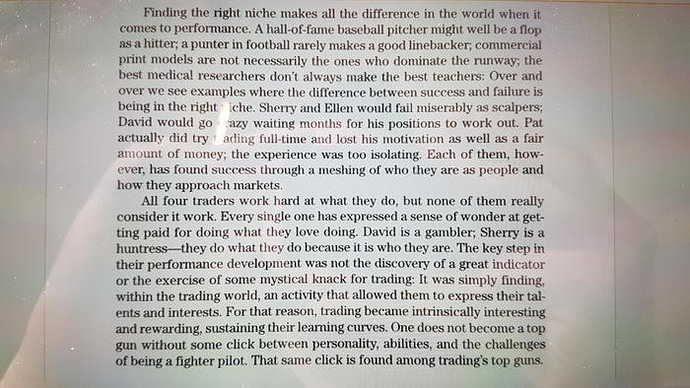 Pretty much [I]every [/I]method that produces a profit is “best” for someone, the trick is to find out first what kind of trader [I]you [/I]are and then find the method that best meets [I]your [/I]particular requirements. the most profitable and best one is that fits your personality and skills the most. scalping is mainly considered as a best trading approach that brings profit in a short time. The key word, there, is “considered”. Many aspiring traders [U]believe[/U] it, but their results demonstrate how mistaken an approach it is, for most people. In a field of endeavour in which the overall success-rates are so low, aiming at scalping must be one of the most sure-fire ways of stacking the deck even further against oneself. And of course there are reasons for that. [I][U]Especially[/U][/I] in the case of forex, where most participants trade against counterparty market-makers who are holding the other sides of their trades and are [I][U]certainly[/U][/I] not going to tolerate a successful scalper, when they’re the people being scalped! Day Trading: Forex day trading strategies is the opening and closing trades on the same day. Scalping: A scalping trading strategy is used by the traders to buy a currency pair and then hold it for a short period of time in an attempt to make a profit. Swing Trading: Forex swing trading is a longer term trading style that requires patience to hold your trades for several days at a time. Position Trading: Position Forex traders usually hold their trades open for months, weeks and years. Yes I as greed with TURBONero. The most profitable n best one is that got your personality n skill. No matter what strategy u use or how many strategies u use. It may be the best for you. But… May be a disaster to me. Cos every one trading habits is totally different. I’m a price reverse hunting scalper, I’m use Sar to hunt for reverse, to mi it a powerful tool n help mi win alot of trades . to mi it a wining strategy, But to other it a disaster when they heard I use Sar… They reaction is eeeeeeeeeeeeeee… Gosh… Wahahahaha. So i feel there no best strategy in the world, the best strategy is yourself. Confidence, dare, sharp. N ofcourse don’t gv up. That the best strategy. No matter what kind of traders. All only hv 1 aim… EARN PIPS. All only hv 1 fear… LOST PIPS. Just relex don’t jump into trade too soon n get into trouble. Trade wisely. Beside all this ofcourse learn price action also. Than use your most powerful weapon which is yourself n fight into forex market. WIN PIPS, KEEP PIPS, N WIN PIPS AGAIN. 1- learn about forex market by general what is the lot what is the charts …etc. 2-learn about every tiny detail in your platform and the techniques which supported by your broker in opening and closing orders. a- read john murvey book about technical analyzes. b- read about news and their effects on charts. e- read about supply and demand zones . a- read about gann squares . b- read about vsa analyzes.